I had high hopes for this post. Hopefully this post - the one in my head - will emerge on Friday or next week or something. Unfortunately it proved very difficult to research on Wednesday evening thanks to the anti-SOPA blackout. Could Dotmund be the first casualty of this crass lump hammer piece of legislation? The answer, of course, is no. But possibly yes. So I thought that instead it would be a good idea to make a start on another idea I have scrawled here in my own blood, namely "colouring in". I think children like to do this, as indeed do some adults. To be honest, I've always hated colouring in and I still do. Is it not enough that I've drawn a picture? However, that may just be me. So I thought it would be nice for my blog to give something back to sort of make up, in some small way, for the hours and hours of your life that you simply won't be getting back. My chosen method is to make 26 pictures, one for each letter of the alphabet, for your children or husband to print out and colour in. Hopefully this will shut them up for upwards of five minutes at a time - ten if they try and keep within the lines - allowing you to have some much needed peace and hopefully staving off that nervous breakdown for another hour or two. Today, 'A'. 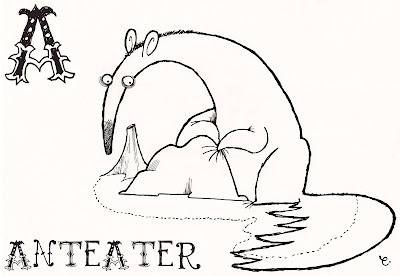 'A' is for Anteater. 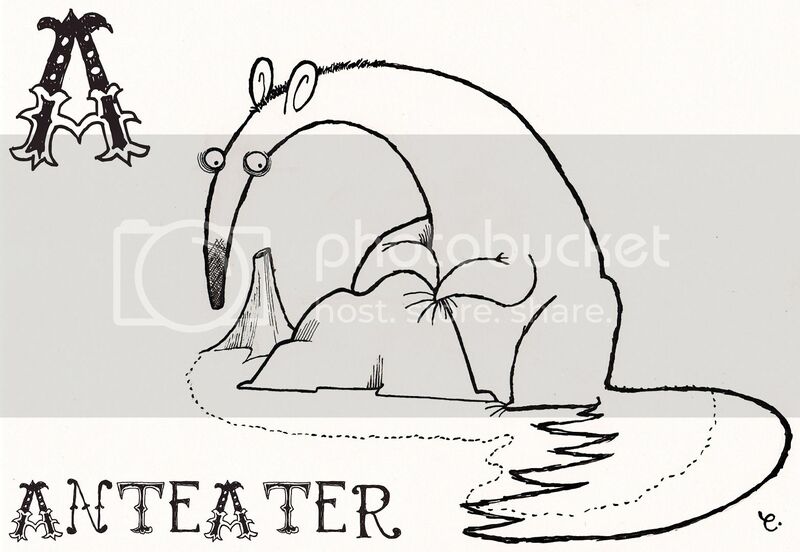 And yes, I know it is technically a Giant Anteater and that Giant Anteater begins with 'G'. If you're going to get pedantic with me about nomenclature then this is going to be an insufferably long year. As this project develops I will be using the label "Animal alphabet" so you can easily gather them all together and rip me off. Note: Blogger is a bit exotic about the way it displays pictures, and it has re-sized this one rather too much to be much use. So here's a the full-size image to download or print or throw poos at: CLICK. Great idea, I just found all of them by accident while trying to find what animal starts with "X". I saw your drawing and then downloaded and printed them all for upcoming Christmas day to keep the kids enteratined! Thanks!